We recently hiked some trails (and roads) in the Port Gamble Heritage State Park forest. It was very pleasant, and there is a beaver pond and wetland area there that is attracting some birds. Off the Beaver Trail, they’ve set up a “wildlife viewing” spur trail that goes right by the pond. I recommend that. Don’t know if this site rises to the level of being included in the guide. There is an ongoing effort to preserve the forest. Bainbridge Island and the Kitsap Peninsula, joined together by a highway bridge over Agate Passage, lie between Puget Sound on the east and Hood Canal on the west. Once completely covered by towering lowland forests of the Puget Sound Douglas-fir zone, this area has been 99+ percent logged off and is now a mosaic of second-growth forest, agricultural land, light to medium development (single-family dwellings with parks and other open spaces), and heavy urban/industrial development (around Bremerton). The landscape is endowed with small lakes, ponds, streams, and wetlands (but no large rivers)—and plenty of saltwater shoreline. The area is relatively lightly birded except for one outstanding site—Point No Point—and, incidentally, a few lesser spots along the standard route from Seattle to the North Olympic Coast. Not that there are few birds! On the contrary, 115 species breed here, and 120 or more are routinely found on Christmas Bird Counts—impressive numbers, considering the county’s small size and comparatively uniform habitat. The rural setting offers a good chance to observe the regular Puget Trough landbirds, including Band-tailed Pigeon, Rufous Hummingbird, Red-breasted Sapsucker, Pileated Woodpecker, Olive-sided and Pacific-slope Flycatchers, Hutton’s Vireo, Violet-green Swallow, Chestnut-backed Chickadee, Bewick’s Wren, Swainson’s Thrush, Black-throated Gray and Wilson’s Warblers, Spotted Towhee, Western Tanager, Black-headed Grosbeak, and Purple Finch. Owls find the mixture of open forest and clearings to their liking: Great Horned, Northern Pygmy- (uncommon), Barred, and Northern Saw-whet all nest. Most visitors arrive by one of the four cross-sound ferry routes. Truth be told, ferry birding is usually dull. Out in the channels you may see alcids, scoters, and gulls as flybys or feeding in tidal rips, but birds are far more numerous in protected waters near the terminals where they may readily be seen from shore. Amazing sightings do occur, especially in migration or a day or two after a major storm along the outer coast. 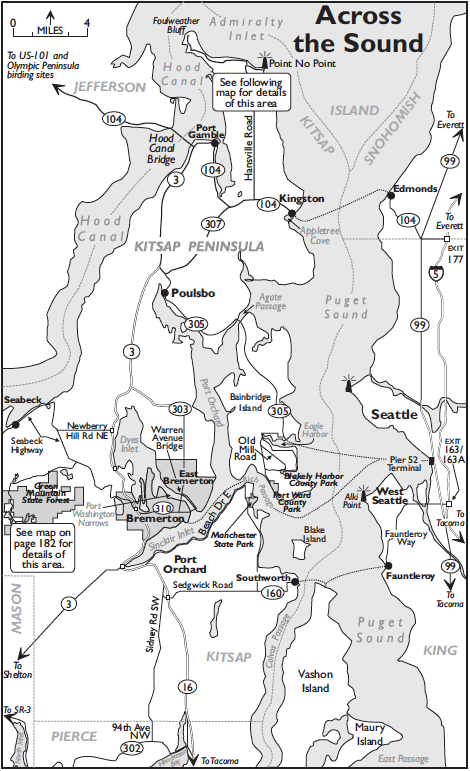 If you should find yourself docking in Kitsap County on a fine early morning in May, June, or July, drive off the ferry, pick up a map, and take some time to go prospecting for birds on your own. Landbirds tend not to be concentrated at a few favored areas, but instead are widely and rather evenly distributed. You are just as likely to find them along the many quiet roadsides as in the public parks. Although most of the shoreline is privately owned, there are numerous spots to get a peek at bays, coves, inlets, and passages. Waterbirding can be good at any season. Pigeon Guillemots nest in sandbank burrows at several places along the shoreline, and the Warren Avenue Bridge across the Port Washington Narrows in Bremerton has a nesting colony of Pelagic Cormorants. Here are a few suggestions to get you started. If you arrive on the Kingston ferry, check the viewpoints on the west side of Appletree Cove, opposite the ferry dock. On Bainbridge Island, go around the west end of Eagle Harbor (where the ferry arrives) and bird your way south through woods and orchards along Old Mill Road NE to Blakely Harbor County Park—an abandoned mill site with rocky shoreline, salt marsh, meadow, and forest, now under restoration (trails and plantings of native vegetation)—and on to Fort Ward County Park. Seabeck, on Hood Canal about a 15-mile drive from the Bremerton ferry dock, offers mixed woodlands, a saltwater bay, and the productive estuary of Seabeck Creek. Not far from the Southworth ferry landing is forested Manchester State Park (Discover Pass needed to park), north of Manchester on Rich Passage. From here you can follow Beach Drive E along the shoreline to Port Orchard, with seabird and shorebird possibilities. Ferries to Bremerton and to Bainbridge Island leave from the Pier 52 terminal at the foot of Madison Street in downtown Seattle. The ferry to Kingston leaves from Edmonds (take Exit 177 from I-5 about 13 miles north of downtown Seattle and follow the signs along SR-104 to the dock). The ferry to Southworth—perhaps the most picturesque of the four routes, and often the birdiest—sails from the Fauntleroy terminal in West Seattle. (Take the West Seattle Freeway exit from I-5 about 2.5 miles south of downtown Seattle, then follow the signs along Fauntleroy Way.) Crossing time varies from 30 to 60 minutes, depending on the route. Service is frequent, but waits for auto boarding can be long during commuting hours and on holidays and summer weekends. For automated fare and schedule information, phone 206-464-6400 in Seattle or 800-843-3779 toll-free statewide, or visit http://www.wsdot.wa.gov/ferries on-line. Kitsap County’s destination birding site, Point No Point is conveniently accessed by the ferry from Edmonds. Drive west on SR-104 from the Kingston ferry ramp to the traffic light at Hansville Road (2.5 miles) and turn right (north). Turn right again in 7.4 miles onto Point No Point Road. The small parking lot at the lighthouse (0.9 mile; toilets) may be full; if so, come back 0.2 mile to a grassy overflow parking strip along the right shoulder or to the adjacent, paved WDFW parking lot and boat launch (ADA accessible; restrooms; Discover Pass required). Walk past the lighthouse along the sandy beach to the point. Admiralty Inlet, on the left, brings oceanic waters to the entrance of Puget Sound, on the right. Strong currents churn up plankton and small invertebrates when tides are running. Large concentrations of Pacific Sand Lance and Pacific Herring gather in the tidal rips at these rich feeding areas, in turn attracting high numbers of marine birds. Until the dramatic decline of the salmon runs, Point No Point was renowned for its sport fishery, for the same reason. In fall migration, Parasitic Jaegers attend flocks of Common Terns that sometimes number in several dozens. Many hundreds or even thousands of Bonaparte’s Gulls work the rip tides in fall and winter. Rarities such as Black-legged Kittiwake and Sabine’s, Black-headed, Little, Laughing, and Franklin’s Gulls are sometimes among them. All the regular Washington alcids occur here seasonally (Ancient Murrelet, mostly in November; Cassin’s Auklet and Tufted Puffin, rare; single records of Thick-billed Murre, Long-billed Murrelet, and Horned Puffin). Western Washington’s first record of Arctic Loon was at Point No Point in the winter of 2000–2001, and Yellow-billed Loon has been seen more than once. When tides go slack, the feeding frenzy ends and most of these birds disappear, but be sure to check the calmer waters back west toward the boat ramp and around the point to the south, which usually have a sprinkling of birds at any tide stage. To the south and west a cattail marsh, edged by brush, is well worth checking, as is the driftwood-lined beach to the south. Point No Point is something of a songbird migrant trap. High flight numbers sometimes pile up here, among them record counts of Western Kingbird, Cedar Waxwing, Western Tanager, and Black-headed Grosbeak. “Dryside” sparrows (Brewer’s, Vesper, Lark, Black-throated) have shown up. Notable vagrant records include Blue-gray Gnatcatcher, White Wagtail (twice), and Indigo Bunting. The uplands to the south—cloaked in mature second-growth forest—are in Point No Point County Park, accessible by a trail that starts where the bluff meets the beach. Return to Hansville Road and turn right. The road bends left at the Hansville Store (0.1 mile), becoming NE Twin Spits Road. Just before the store, the beach at Norwegian Point County Park, on the right, provides another spot to scope Admiralty Inlet waters and sometimes serves as a high-tide shorebird roost (mostly Black-bellied Plovers). Continue westward on NE Twin Spits Road. At 2.7 miles from the store, look for a blue address sign numbered 3484, on the right, followed by a pulloff and hidden trailhead in the trees on the left. Park here; this is the access point for The Nature Conservancy’s Foulweather Bluff Preserve. A short trail leads through mature hardwoods and conifers, with an understory of Sword Fern, Salal, Evergreen Huckleberry, and Cascade Oregon-grape, past a quiet lagoon to the beach on Hood Canal. Hutton’s Vireo and other lowland forest birds can be found here. The road ends in another 0.7 mile along the waterfront at Twin Spits, with a view across the mouth of Hood Canal. Go back to Hansville Road and south to the traffic light at SR-104. Turn right. Follow SR-104 as it turns right at the next traffic light (1.4 miles) and reaches Port Gamble in another 3.5 miles. Pay attention to the speed limit in town. Where the highway takes a 90-degree turn to the left (approximately 0.2 mile) go straight ahead a couple of blocks on Rainier Avenue to a small park in the center of this well-preserved old mill town, founded in 1853 by the Puget Mill Company (later Pope & Talbot), once the dominant lumber company on the Sound. At the time of its closing in 1995, the Port Gamble mill was the oldest continuously operated sawmill in the U.S. You can scope the waters of Hood Canal from the overlook, but the log dumps are off-limits. The park’s trees may hold passerines in migration. Return to SR-104 and turn right. Just after leaving town turn right onto Wheeler Street (0.8 mile), then right again in 0.2 mile into Salsbury Point County Park. The boat-ramp parking lot offers water-level views of Hood Canal, with good seabird possibilities. Back at the highway, a right turn leads in 0.4 mile to the east end of the Hood Canal Bridge. 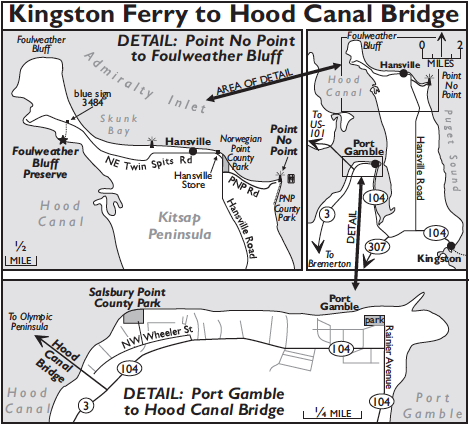 Here you may turn right with SR-104 to reach Port Townsend and the coast (page 58), or the west shore of Hood Canal (page 214). Continuing straight ahead on SR-3 rather than crossing the bridge will take you down the Kitsap Peninsula toward Bainbridge Island, Bremerton, and points south. If you are attempting to find Mountain Quail, your itinerary may well point you across the Sound via the Bremerton or Southworth ferries. Introduced long ago and once widespread in Western Washington, this elusive species hangs on in a few scattered populations from the Kitsap Peninsula south and west toward Shelton and Elma. Locations may not be predictable from one year to the next, but Mountain Quail sightings are almost always reported, so it is worth monitoring eBird and Tweeters in advance of your visit. Even if there are current reports, however, your chances of ticking this bird are only fair. Recently, birders have tended to zero in on the Tahuya Peninsula, in the hook of Hood Canal west of Belfair in Mason County (page 219). However, Mountain Quail appear to be no less numerous in far more lightly birded Kitsap County just north of there. Most of this area is covered by commercial tree farms, with tracts harvested in rotation leaving a few standing trees, stumps, and bare ground, soon colonized by a patchwork of low, scruffy growth. This is ideal Mountain Quail habitat for the decade or so it takes replanted trees to crowd out the open understory. Forest roads are gated to exclude vehicles but are open to foot traffic. Time spent exploring these roads in the proper early-successional habitat likely will pay off. The quail are far easier to find in the first two or three hours after dawn. The best season is from March to early May when males are calling. They can be heard from a great distance and sometimes come in to recordings. You may hear family groups clucking in the brush, but they are adept at racing away under cover. Count yourself lucky if you get a brief glimpse. 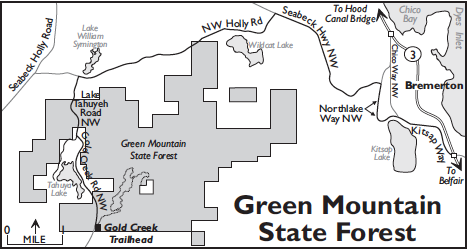 One productive Kitsap County site is Green Mountain State Forest. A hike to the summit of Green Mountain through various ages of forest and some meadows (about five miles round trip, 1,200 feet elevation gain) has yielded numerous Mountain Quail observations, as well as Ruffed (near the bottom) and Sooty Grouse. Green Mountain is also the most accessible place in this predominantly low-lying county to find species such as Northern Pygmy-Owl, Hammond’s Flycatcher, Cassin’s Vireo, Gray Jay (summit), Townsend’s Warbler, and Townsend’s/Hermit hybrid types. The best birding route to the summit departs from the Gold Creek trailhead. Exit from SR-3 at Kitsap Way in Bremerton and turn west (east from this exit, SR-310 leads to the Bremerton ferry landing). At a Y-intersection in 1.4 miles, take the left fork (Northlake Way NW). In 1.0 mile, turn left onto Seabeck Highway NW, then left in another 3.0 miles onto NW Holly Road. Continue 4.2 miles to the intersection with Tahuyeh Lake Road NW (aka Lake Tahuyeh Road NW) and turn left. In 1.2 miles, stay to the left onto Gold Creek Road NW. The trailhead parking lot is in 1.8 miles on your left (restrooms; Discover Pass required). Be aware that parts of the forest may be closed during logging operations, and that this popular trail is used by motorcycles, ATVs, horses, and mountain bikes as well as by hikers. Weekday mornings are usually the most peaceful time for birding.